"One man can change the world with a bullet in the right place." If you ever spent time in a restrictive school environment as an outcast, then If.... will certainly resonate on that basic level, but its school setting is merely a stand-in for the larger nature of society itself, with its pointless rituals, undeserving leaders and bullies, and the desire and need to make a choice and stand up for what one believes in, even to the point of revolution. The film's ending will likely come off as in poor taste in a post-Columbine/Virginia Tech/etc world, but the end message is clear and worth stating. Mick Travis (Malcolm McDowell) is a student at College House, a generic British public school (their name for what we Yanks term private schools), where he and his two friends Johnny (David Wood) and Wallace (Richard Warwick) endure the drudgery of tradition and hypocrisy on display while waiting for their eventual escape into the world. The film is broken into chapters detaining different aspects of their days, leading into the dissatisfied trio's ultimate stand against the forces arrayed against them. McDowell's makes his big screen debut here, and it is a role seemingly tailored for him, leading, as McDowell comments on the disc, to his getting cast as Alex in A Clockwork Orange. It's impossible to imagine anyone else in this role, as McDowell blends anger, frustration, and sheer bloody-mindedness (literally and figuratively) to perfection. It doesn't ever seem like acting; he just is Mick. If....'s boldest stroke is perhaps its gradual shift into surrealism during its second half, as Mick and his friends make their move toward breaking free of College House. It starts with Mick's theft of a motorcycle with Johnny, and their meeting of The Girl (Christine Noonan), who magically re-appears near the end to join the boys in their final stand. Mick and the Girl's impromptu wrestling starts a series of similarly dream-like events, from dead men kept in drawers to naked matrons wandering the school and still more. The result is a riposte to those who would deny such feelings in us, demanding that we instead focus on useless routines like memorizing the names of each superior and otherwise just getting by. When newcomer Jute (Sean Bury) is drilled by his classmates on getting the names and responses right, we can see that it's all just silly game; Jute hasn't yet learned to produce the proper attitude to succeed in his environment. Mick and friends present one possible outcome to fighting against that, though their taking up of arms can't really be taken literally. Our basic enjoyment (or lack thereof) of that solution should remind us of our own awakening to the world and how we react to it. Image Transfer Review: Transferred in its original aspect ratio of 1.66:1, If.... looks quite sharp and colorful for a film of its time period, though it is a bit soft by today's standards. Otherwise, there's nothing really to complain about here. The optional subtitles are on the large side and in white. Audio Transfer Review: The original mono soundtrack performs quite well, within the limitations inherent to it. Dialogue can be a bit difficult to understand at times, but that could well be byproduct of the low budget conditions. Extras Review: The first disc includes a commentary track with McDowell and scholar David Robinson, recorded separately and edited together. McDowell provides general memories of working on the film and his thoughts about it, while Robinson provides some analytical as well as historical background about the film and its milieu. Fans will want to check this out. The second disc gathers three items. The first is an episode of the BBC Scotland series Cast and Crew focusing on the film (42m:05s), set up in a round table discussion format and including Stephen Frears, Michael Medwin, Ian Rakoff, David Sherwin, and Miroslav Ondricek. McDowell also participates via taped comments. It's interesting to hear the differing opinions and background info provided here. Next is an interview with Graham Crowden, who plays the history master. Crowden worked extensively with Anderson and shares his impressions of the film and the man (14m:37s). Lastly is Thursday's Chidren (22m:08s), Anderson's Academy Award-winning short documentary about a British school for deaf children, narrated by Richard Burton. It's a moving and fascinating look at another section of societal underdogs and outcasts. 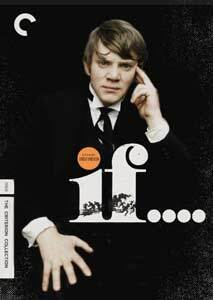 Lindsay Anderson's If.... remains a galvanizing statement about personal freedom at all costs, presented beautifully in this debut DVD edition from Criterion. Some thoughtful extras expand appreciation of both the film and its director.